WASHINGTON (AP) — A new look is coming to Nutrition Facts labels on food packages, with more attention to calorie counts and added sugars. And no longer will a small bag of chips count as two or three servings. Michelle Obama said parents will be the beneficiaries. "You will no longer need a microscope, a calculator, or a degree in nutrition to figure out whether the food you're buying is actually good for our kids," the first lady said Friday, announcing the new rules. 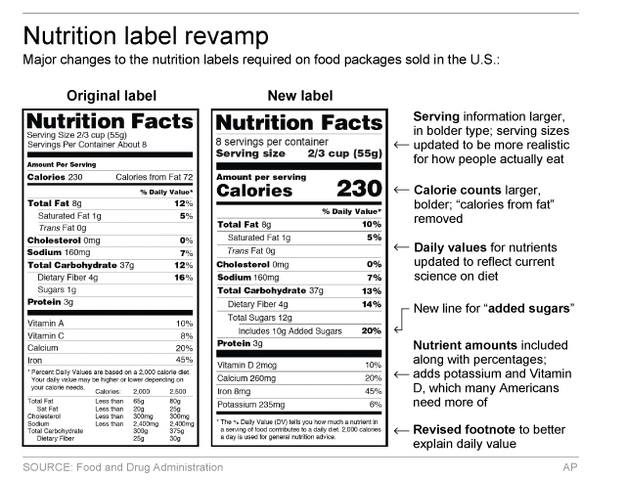 The changes were proposed by the Food and Drug Administration two years ago and are the first major update to the labels since their introduction in 1994. They are now on more than 800,000 foods. The overhaul comes amid scientific advances. While fat was the focus when the labels were created, calories are of greater concern these days. The calorie listing will now be much larger than anything else on the label, making it hard to overlook. Nutrition advocates have long sought an added sugars line on the label so consumers can understand how much sugar in an item is naturally occurring, like that in fruit and dairy products, and how much is put in by the manufacturer. Think an apple vs. sweetened apple sauce. The labels will also include a new "percent daily value" for sugars, telling people how much of their recommended daily intake they will get from each item. This year's guidelines recommend no more than 10 percent of calories from added sugar, a limit of around 200 calories or 50 grams. "The new labels should also spur food manufacturers to add less sugar to their products," Michael Jacobson, president of the Center for Science in the Public Interest, an advocacy group. He said it's currently impossible for consumers studying the labels to know how much sugar fits into a reasonable diet. Serving sizes will be clearer, listed at the top of the graphic. And they will be less misleading, making it easier to figure out how many servings are in a container. That means revised calculations for about a fifth of foods. The idea behind listing a whole package of food, or an entire drink, as one serving isn't to motivate people to eat more. It is to help them understand how many calories they are consuming. By law, serving sizes should be based on actual consumption and not ideal consumption. A serving size of ice cream will now be based on average consumption of 2/3 of a cup. Previously it was a half-cup. Products between one and two servings, such as a 20-ounce soda or a 15-ounce soup can, will be labeled as a single serving because that's how much people typically eat in one sitting. Larger packages, like a pint of ice cream, will have labels with two columns. One will show serving information; the other is for the whole container. Labels also must now list levels of potassium and Vitamin D, nutrients Americans don't get enough of. Vitamins A and C are no longer required but can be included. Iron and calcium stay. Most food companies have until July 2018 to comply. Smaller companies have an extra year. Industry reaction has been mixed. The Sugar Association said the emphasis on added sugar distracts attention from calories, potentially causing confusion. Some food producers have been supportive. Mars Inc., maker of Snickers and M&Ms, said sugar can be part of a balanced diet and "making nutrition guidance clear to consumers is the right thing to do." "This update is timely as diets, eating patterns and consumer preferences have changed dramatically since the Nutrition Facts panel was first introduced," said Leon Bruner of the Grocery Manufacturers Association, which represents the food industry's largest companies. Obama announced the final rules for the labels at the annual health summit of her "Let's Move!" campaign against childhood obesity.